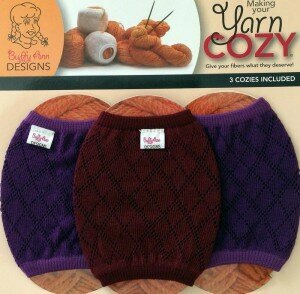 Buffy Ann Designs recently sent me these yarn cozies. I did not know I needed these but now I don’t want to knit without them. 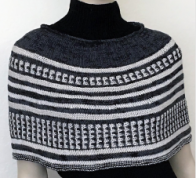 If you’ve had the disruptive experience of a ball of yarn that insists on coming apart while you are knitting, then you need to try these cozies. They keep your yarn from unraveling while working from your center-pull. Genius! In addition to the clever yarn cozies, Buffy Ann also offers some convenient gadgets and project bags. One of them is this Snappy Bag. Called Little Black Bag it is as useful as the little black dress we all have in our closets. It comes with a zippered notions pocket. 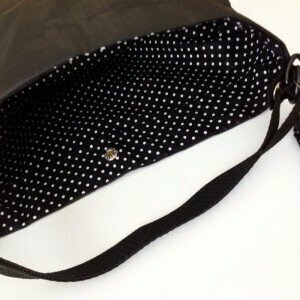 Both the bag and notions pocket are lined in a contrasting fabric. This one is white with polka dots. I appreciate the lining being a light color so I can see everything inside my bag. As you can see, the cozies work nicely with the bag. Buffy Ann describes the bag as “small and roomy, snaps keep your multi color projects tidy. Adjustable straps for comfort or attach to belt with enclosed clasp.” I like the shape of the bag, it is like a little bucket. 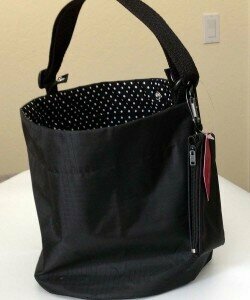 It is perfect for carrying projects around the house or when I’m on the go. Check it out on their website and see what else Buffy Ann has for you.